When Toyota's iconic Tacoma pick-up truck goes through a major facelift and significant structural upgrades, it is very big news. 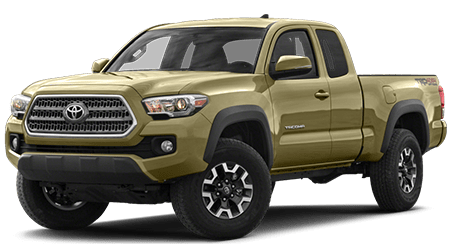 More than any other truck, the Toyota Tacoma, has a cult-like following of die-hard fans who herald its every grille change and new accessory. No kidding, they have clubs and newsletters to stay in touch, and this has boosted the Tacoma's resale value to eyebrow-raising status. No one will be disappointed with the 2016 Tacoma's retuned suspension, new powertrain, and snappier cabin structure. Longtime fans of the rugged Tacoma will love the new quieter ride, thanks to advanced aerodynamic and acoustic technology. If you live in or near Charlottetown, Stratford, Mt. Herbert, Cornwall, Marshfield, Brackley, and Milton Station you have an opportunity to see the re-imagined Toyota Tacoma in all its glory at Charlottetown Toyota before anyone else. We are centrally located at 1 Superior Crescent Charlottetown, PO BOX 730 in Charlottetown, PE, and we have a huge inventory of 2016 Toyota Tacomas just waiting for a test drive. We welcome repeat Tacoma buyers, rabid fans, and just the mildly curious. There is something for everyone in the sleek new Tacoma - hard-hat Dads, busy Moms, and even garage band superstars. The 2016 Toyota is no ordinary truck! The biggest change to this year's Tacoma (and the really exciting news) is what's under the hood. The new engine, a 3.5-liter direct-injection V-6 model, is smaller than last year's engine, yet it boasts significantly better passing power and regal smoothness, as well as an astonishing 278 hp and 265 pound-feet of torque. You get a choice of six-speed manual or six-speed automatic transmission, and you cannot go wrong either way. The manual transmission is quick and responsive, but the six-speed automatic is more popular among younger customers now because it upshifts and downshifts like a dream. The Toyota Tacoma has been outselling its nearest competitor by TWICE, and while it didn't need any new bells and whistles, you get the feeling they were added this year just for the ooohs and aaahs. Befitting the Tacoma's newfound V6 strength are an available scoop and meaty grille, which help showcase the new chiseled character lines and muscular fenders. At night, your tough-as-nails Tacoma looks like a million dollars with standard projector-beam headlights that pierce the darkness brightly, and dramatic C-shaped taillights that leave a futuristic trail as you drive off. Coming or going, Tacoma turns heads and raises eyebrows everywhere. Come to Charlottetown Toyota to see the all- Toyota Tacoma trim packages, including the TRD off-road edition, in the comfort of our modern and spacious showroom at 1 Superior Crescent Charlottetown, PO BOX 730 in Charlottetown, PE. We cater to drivers and families from Charlottetown, Stratford, Mt. Herbert, Cornwall, Marshfield, Brackley, and Milton Station, so we have a healthy inventory of new Tacomas. We also stock certified pre-owned Toyota Tacomas which have undergone rigorous testing and refurbishing. If you're a big fan of the Toyota Tacoma, get yourself down to Charlottetown Toyota, where we have so many 2016 Tacomas to choose from that you are sure to find the perfect match.